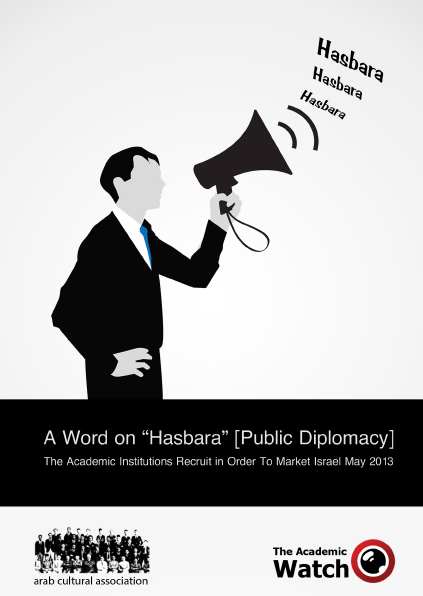 < A Word on “Hasbara” > is the Academic Watch Project latest report. It looks at the Israeli academic institutions’ recruitment in order to market Israel through Hasbara (a Hebrew word that literary means explanation) programs. These courses claim to provide students with tools and skills of marketing Israel and its policies through websites and social networks, and are considered a source of pride to the institutions that offer them. These courses constitute a clear contradiction to the academic values of conduct that rely on political and critical independence and freedom of thought, and also show the extent of the involvement of these universities in the political, military and diplomatic policies of the government. The purpose of this paper is to uncover the content of the Hasbara courses and programs in Israeli academic institutions, their sources of finance and their connection with the Ministries of Foreign Affairs and Public Diplomacy and other international right-wing Zionist movements. The “AcademicWatch” project sprouted from the “Youth Empowerment” program in the Arab Culture Association (ACA), with support from the Open Society Fund.